The German writer, Hermann Broch, said that a landscape view was poor compensation for the misery of existence. Anyone wanting to understand the difference between 20th Century existentialism and 19th Century romanticism can ponder on the quote by Broch and read his The Sleepwalker Trilogy. Broch accepted that nature was impressive but he refused to let a mountain walk and a few daffodils mitigate the bleak consequence of time, decay and death. Some years ago I stood on the summit of Skiddaw, the mountain that overlooks the town of Keswick. I talked to an American. ‘I like to think I’m from here,’ he said. ‘Seattle on the West Coast,’ he said. ‘You’ve passed a lot of tall mountains to get here,’ I said. The American meant that the Lake District has history. The Castlerigg Stone Circle, just outside the town, confirms the existence of prehistoric life around Keswick. Later, Wordsworth and Coleridge wandered the hills of the Lake District. The footsteps of the two poets persuaded the American that his own taller landscape was insufficient. Coleridge and Southey stayed at Greta Hall in Keswick. The building has now been converted into holiday flats. Tourists can sleep ‘nine fathoms deep’ in their beds and ‘cannot choose but hear’ the ghost of Coleridge polishing the stanzas of The Rime of The Ancient Mariner. Well, maybe not. William Wordsworth described his art as the ‘spontaneous overflow of personal feelings recollected in tranquillity’. Not just Americans have let their personal feelings overflow on mountain slopes. English Romanticism was a reaction to Industrial Capitalism. The early beliefs of Wordsworth were liberal and radical. Nature was important because its grandeur and space inspired intuition and emotion. It also allowed freedom from other human beings, those willing to welcome the material future. 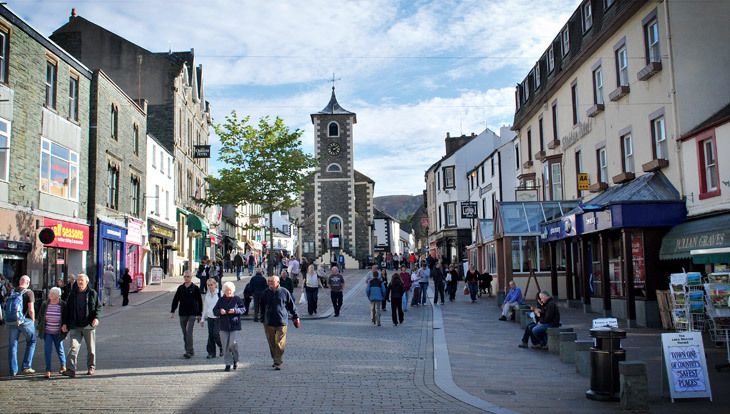 John Ruskin thought that Keswick was too beautiful place to live in, but it has a population of almost 5000 people. They earn their living from tourism and agriculture and it has been like that from the 18th Century. Wordsworth was obliged to endure tourists. The Lake District lacks the scale and drama of Scotland but the seven English mountains over 3000 feet are all in the Lake District, as are 24 of the 26 highest mountains in England. 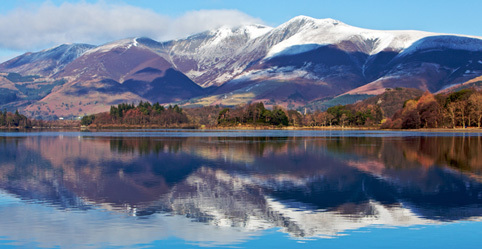 Climbers are sniffy about the simple walk to the summit of Skiddaw but the mountain has elegant lines and is crucial to the impressive skyline of Keswick. The Lake District is not short of icons but Alfred Wainwright added his name to the list when his self-published pen and ink guides to the hills and mountains of the region became global million sellers. The Alhambra Cinema was opened in 1913 and is a fine mix of the latest technology and traditional cinema architecture. The Theatre By The Lake has a splendid setting and a good programme. This year the plays include Suddenly Last Summer and Abigail’s Party, plays designed to encourage theatre going rather than soothe holidaymakers who fear the thoughts of ‘frightful fiends’. The Pencil Museum claims that the very first pencil was made in the local factory. Keswick has plenty of festivals, and the pencils can be used for taking notes. Posted in Alfred Wainwright, Alhambra Cinema Keswick, Castlerigg Stone Circle, Greta Hall, Hermann Broch, John Ruskin, Keswick, Keswick Pencil Museum, Keswick Theatre By The Lake, Lake District, Samuel Taylor Coleridge, Seattle, Skiddaw, The Sleepwalker Trilogy, William Wordsworth and tagged Britain, Culture, history, politics, travel on June 28, 2015 by Howard Jackson.